Pondering pyramids is tricky business. The mere mention of pyramid mystery elicits rolled eyes and wise cracks. Fortunately I have a thick skin and open mind. Its interesting how things we don’t understand or can’t explain somehow become quackery. I honestly have no explanation for the pyramids or countless ancient mysteries that rattle in my head. It would be impossible to arrive at any conclusion based on what little we know. I don’t believe we’re alone in the universe, I’m certain there were civilizations long before our accepted timeline of history, I don’t believe a ” sentient being ” is responsible for life on earth. For these reasons I embrace ancient mysteries. Nothing less than awe describes the accomplishments of ancient cultures. The Great Pyramid at Giza is remarkable. It stands as the most perfectly aligned structure on earth to “true north”, within 3/60th of a degree. The curves built into the radius exactly match that of earth. We think of it as a 4 sided structure; it actually has 8, each side is slightly concave – a feature only evident from above on the spring and fall equinox when a shadow is cast. The 35th course of blocks is thicker than the rest and gives a mathematical figure equal to the precision of the equinoxes. Shafts built into the sides are perfectly aligned with Orion and Sirius. Click on the link below and ponder the incredible list of head scratchers associated with this structure. 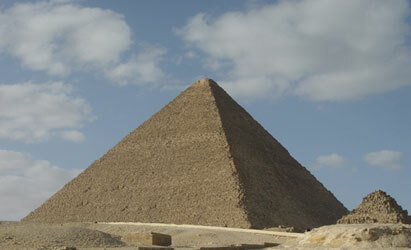 No one knows how many pyramids are on earth, they’re found in every corner of the world, and number in the thousands. As with so many ancient structures they defy explanation. Pondering their wonder doesn’t mean you believe in alien contact, the supernatural, or deny God; al it means is that you’re willing to entertain possibilities.